Magnetic screen doors have magnetized flaps that easily open and close behind you, your pet or child. Buyers say that the mesh filters out disease-carrying insects while allowing sunlight and fresh air to circulate throughout your home (Source). They're especially useful for high-traffic areas- dogs, children and party-guests can come and go without the hassle of opening and closing a door. 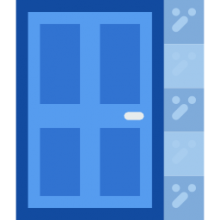 They install on door frames using either adhesive Velcro or tacks and fit most traditionally sized doors- the manufacturers specify the maximum doorway dimensions (Source). If your doorway measures less than those dimensions, you're probably going to get a good fit. The Premium Choice Products mesh door has 3 different sizes if your doorway is irregularly sized (32"x 82" / 34” x 82" / 36” x 82"). Check out our comparison table below for different sizing options. You'll want to perform some measurements prior to purchase- check out this installation guide or watch the Flux Phenom installation video below to get a sense of how it's done. The Flux Phenom magnetic screen door ships with black, metal thumbtacks and a hook & loop backing for easy install and seasonal storage removal. It will fit all doors that are 38"x 82". This means that it will be a perfect fit if your door measures 38" or less in width and 82" or less in height. It includes a lifetime warranty- so you can always get a replacement if anything goes wrong with it. Check out this video for metal door frame installation. If you have a metal door, magnetic screen doors might not work for you because they will cling to the door. As well, if live in an area with high winds, that can also be somewhat troublesome unless the bottom seam is weighted. The Homitt Magnetic Screen Door 4.5 $ 36" x 82"
The Lux Screens Magnetic Screen Door 4.9 $ 34” x 82"
The Premium Choice Products Magnetic Screen Door 4.2 $ 32" x 82"/ 34” x 82" / 36” x 82"
This magnetic screen door offered by Flux Phenom is a good option for someone who needs a reinforced screen mesh that fits doors up to 38’’ x 82’’. Users love the functionality and quality of this fly screen for doors, but some do complain about its durability and construction. This product features powerful magnetic cubes and magnetic strips along the middle seam which allow the door to open easily and close seamlessly. It is great for keeping bugs out and at the same time letting fresh air in and allowing pets to go in and out of the house with ease. This fly screen mesh seems like a good choice if you are looking fora magnetic screen door with a higher thread count and reinforced edges. The general user consensus concerning the Flux Phenom reinforced magnetic fly screen for doors is that it is a high-quality, durable and very easy-to-install item. Users state that the center strip magnetic closure works perfectly and that they haven’t experienced issues with the screen falling down. One happy purchaser shares that after she emailed the company informing them about the screen which started to tear a little at the top, the seller shipped a new one right out for free. However, some buyers complain about the fact that the product they received didn’t last long. One dissatisfied purchaser says that the sticky strip for metal frames doesn’t hold well. Another one complains about the construction, saying that the magnetic screen doesn’t hold up against bigger dogs. This magnetic screen door offered by Homitt is a solid option if you are looking for a heavy duty mesh curtain with full frame Velcro. Users love the functionality and sturdiness of the mesh, but some do complain about the screen falling off. This product features26 sewed in magnetic points (6 sets of magnetic seal and 7 sets of magnets) which make the screen door close quickly and silently.It fits door size 36” x 82”. 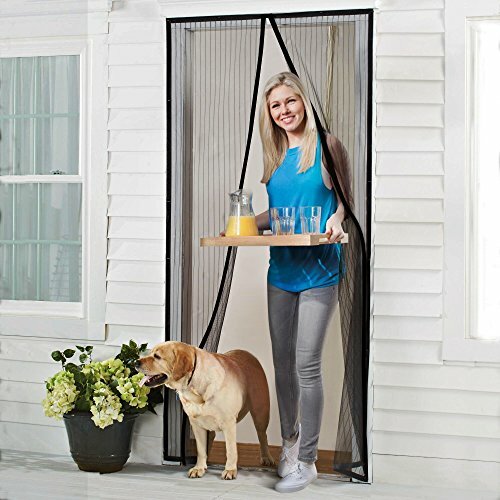 This magnetic screen door might be a solid choice for someone who needs a mesh frame that will keep mosquitoes and flies out and let pets run in and out. 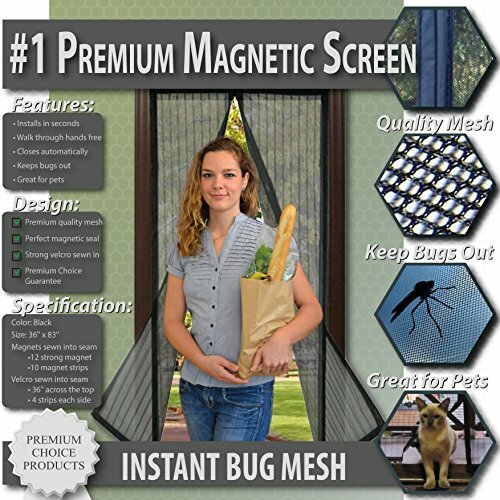 In general, users have a favorable opinion of this easy-to-install mosquito screen for doors.What they praise is that the product is very well made, with sturdy mesh and strong magnets. The key selling point they find are the weights on the bottom, which other screen doors don’t have. As one online reviewer shares, there are a lot of strong magnets sewn in the mesh and therefore not in danger of falling out or apart. However, some purchasers complain about the Velcro which separates from the upper most layer, and it can peel off the wall if not tacked in properly. One dissatisfied buyer complains about the item being too dark, almost as a blackout curtain. 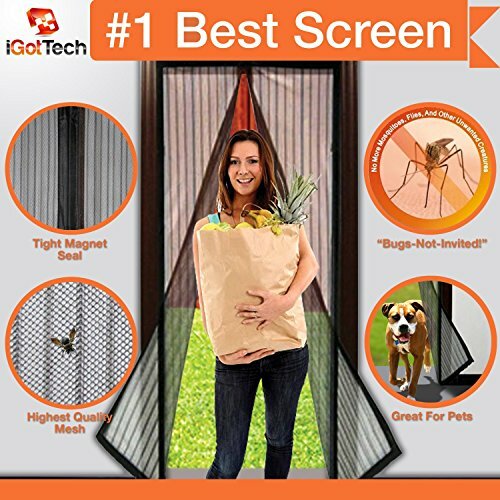 This magnetic screen door offered by iGotTech is a solid option for those who need a full frame fly screen for doors. Users like that the product does its job, but some do complain about the cheap mesh and poor quality magnets. This product features 26 powerful magnets, which are sewn in the reinforced edges. The entire frame is lined with super-duty and reinforced Velcro along every inch. If you are looking fora magnetic screen door with a tough mesh that fits doors up to 34’’x82’’, this might be a good option. In general, users have a favorable opinion of this iGotTech magnetic screen door and they state that it works great, the materials are substantial and the Velcro has remained where it was attached. Also, it is very easy to install. However,some purchasers complain about the cheap mesh that tears apart easily and the magnets that become weak and don’t hold after several months, as well as about the fact that the magnets will likely stick to the door if they’re made of metal.One buyer warns that this product is not for standard front door or sliding door. Another one says that8″ gaps between magnets give plenty of room for bugs to get there way in. If you are looking for a top-rated magnetic screen door, you might want to consider this one offered by Lux Screens. Users love the sturdiness and quality of this screen and so far have no complaints about the product. This product features a fiberglass mesh material which is up to 10 times stronger than traditional polyester screens. It is filled with 26 powerful magnets, which are sewn in the reinforced edges and attached to the fiberglass. The full frame is lined with super-duty, reinforced Velcro along every inch ensuring this screen will never fall. This fiberglass bug screen could be a good choice if you want a durable magnetic screen door that won’t break or tear as some cheaper polyester screens do. So far, buyers have only positive things to say about this magnetic fiberglass screen door. They state that it is much heavier than a regular screen and due to better quality than a mesh screen it won’t rip easily. In addition, users say that the magnets are strong and that the product is easy to install. If you are looking for a magnetic screen door, you might want to consider this mesh curtain offered by Premium Choice Products. Users like the functionality of this mesh, but some do complain about its durability. This product features strong magnets inside the seam, highest quality mesh and a full-length Velcro strip sewn into the mesh across the top and down each side.It is available in black and white color. If you are looking for a pet and toddler-friendly bugs screen door, this might be a solid option. In general, users say that this Premium Choice Products magnetic screen door is a well-constructed and easy-to-install item. They say that it works as advertised and is a good value for the price. However, some purchasers complain about the durability of the product. Many buyers complain about the Velcro glue which doesn’t hold up long. One online reviewer advises being very careful with the metal pins which tend to fall out of place. 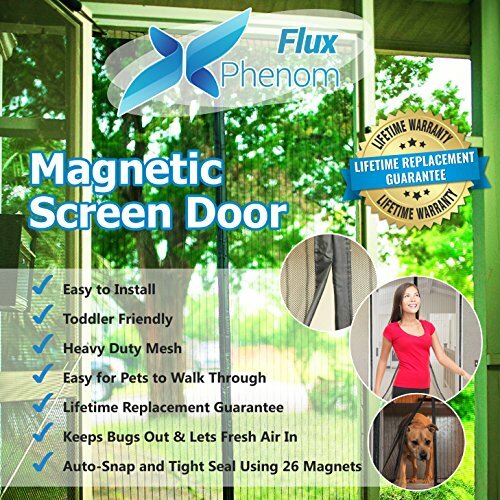 The first reinforced magnetic screen door we took a look at is provided by Flux Phenom- it's designed for doors all the way up to those that measure 38" x 82". The manufacturer has marketed it as an easy to install, heavy duty mesh option that is kid and pet-friendly, ensuring that insects don't get in. The way it works, it's middle seam is lined with magnetic cubes in a strip so that the door flaps open and close seamlessly. In addition, since it easily enables your pets to freely come and go, your screen doors will no longer suffer from cat or dog claw marks. It ships with Velcro tape so that you can attach it to vinyl- with some buyers saying they remove it seasonally so that in the winter they can simply take it down for storage. Another reviewer says that they have installed it on a relatively small passageway and they were able to pleat the sides so that they were folded to make it smaller, using metal clips to hold the pleats. Buyers were highly impressed with this option, saying that it was simple to install in their doorways and their dogs were quick to figure out how to work it. Indeed, reviewers say they can now safely open up their sliding glass doors in the summer for a circulating breeze because they know the interior of the home is protected from wasps, bees, mosquitoes and other annoying pests. Another buyer says that she has three small children and this reinforced magnetic screen door means she can keep her backyard patio sliding glass door open to allow her children to come and go. Another homeowner tells us that after a year of use the mesh developed a small hole- the buyer was amazed that they were able to redeem the lifetime warranty and receive a completely new magnetic screen door for nothing. The second magnetic screen door we examined was the Homitt. It's designed for doors that are 36" x 82"- it's built with antioxidant, high-density mesh, ensuring that fresh air can freely circulate inside your home while preventing pests from getting in. The bottom of the mesh curtain flaps are also lined with magnetic gravity sticks to ensure it doesn't blow and billow in the wind. It ships with a Velcro roll and pushpins and includes a 12 month warranty. They are quick to emphasize you should do some initial measurements- you'll want to assess your door frame and door and make a selection based on the outer diameter. Another thing that buyers should be aware of, if you have a metal door, the magnets will stick to it and the door won't close. Buyers say it is best to reinforce it using the included push pins or even a staple gun because adhesive tape can melt off in the summer. One buyer said that it was a relatively inexpensive and easy to install option- saying that you'll want to ensure that the width you purchase is accurate and the height as well to ensure there isn't a gap at the bottom of your door or a scrunched up a pile of mesh that makes opening and closing difficult. The third magnetic screen door we examined is designed to fit doors up to 34" x 82" and includes reinforced magnetized edges that the manufacturer says will never suffer from gaps or breaks. One buyer says they were able to install it themselves without any additional help, that the instructions were simple to follow, the build quality was good, and it's easy to take down for a seasonal storage. Another buyer who has three large breed dogs who love the outdoors tells us that he was able to train his pets to nose through the center of this magnetic screen door so that they can come and go as they please and enjoy time out of doors exercising. Buyers say that they leave the velcro strips up over the winter months and reinstall the screen in the summer months. The fourth magnetic screen door we took a look at is provided by Lux Screens- it's built with fiberglass mesh that is designed to fit doors up to 34" x 82". They warn buyers in advance that you want to have a 1 inch overlap surrounding the door opening so that you can attach the Velcro. When you purchase, you'll receive the rip and pet proof fiberglass mesh screen door, a Velcro fixing kit, a tack fixing kit and a lifetime guarantee. Buyers were impressed by the ribbed tacks- plus since they are black very easily blend into the black Velcro. One handy tip is that you'll want to clean the surface prior to applying the Velcro strip to ensure that it bonds securely. Homeowners say that the mesh is incredibly dense and strong, yet at the same time allows sunlight to pour into the house and a circulating breeze that is free of airborne insects. The last option we examined was the Premium Choice Products magnetic screen door- they have provided a couple of different sizes-32 to 82, 34 to 82 and 36 to 82-inch configurations. This polyester mesh option provides strong Velcro strips and pushpins utilizing a combination of magnetic blocks and strips sewn into the seam to ensure a gap-free doorway. The manufacturers are careful to emphasize the family friendliness of the screen door mesh curtain- saying that it frees you from the fear of disease-carrying insects enabling you to concentrate on family dinners. Plus you'll no longer have the aggravation of constantly closing the door after your children have filtered out into the backyard, forgetting to close the door behind them. One buyer advises that you should be careful with the metal pins you use to install the door- in her experience, they are prone to dislodging, which can pose a safety hazard to bare feet. Another reviewer had some difficulty getting it properly configured on his 36-inch door- he ended up having to install it on the inner lip area of the door frame, which meant that its sides were not as securely installed as they could've been. Another complaint was since the magnets are sewn into its seam it generated some apertures for insects to discover- and in this homeowner's opinion it would've been better to have externally mounted magnets for a tighter seam fit. Another homeowner who enjoys barbecuing with his family in the backyard estimates that on a daily basis his family of six go in and out of the door over 100 times- so purchasing of this mesh doorway was an efficient decision for them.